Diabetes mellitus (DM) was prone to happening in posterior circulation infarction (POCI) and DM also has the impact on the lipids, our study was to investigate the correlation between lipid compositions and POCI. Data was collected from the patients with acute ischemic stroke (AIS) hospitalization in Affiliated Drum Tower Hospital of Nanjing University Medical School from October 2008 to May 2012. Lipids and other risk factors in the different populations were investigated in relation to occurrence of POCI based on the infarction location. Six hundred ten patients with AIS were included in this study, which had 428 with anterior circulation infarction (ACI) and 182 with POCI. Elevated Triglyceride (TG) and decreased High density lipoprotein cholesterol (HDL-C) were seen in the POCI of total populations and AIS without DM compared to the ACI, but not in the populations of AIS with DM, so did the elevated TG/HDL-C ratios. Also, the percent of low HDL-C level and high TG level were higher in POCI group than that in ACI group. Furthermore, single factors logistic regression demonstrated that TG, HDL-C and TG/HDL-C ratio were correlated to the POCI whatever in the total populations or AIS without DM, but this kind of trend just maintained in the populations of AIS without DM after adjusting by relative interference factors. Dyslipidaemia was prone to happening in POCI compared to ACI in the non-diabetic populations, which was correlated to the pathogenesis of POCI. Acute ischemic stroke (AIS) was divided into anterior circulation infarction (ACI) and posterior circulation infarction (POCI) according to the infarction location, a difference was made between ACI and POCI in terms of clinical manifestations and prognosis. Despite POCI just accounting for 20% of AIS, and it would have a relatively good outcome, but it had high rate of recurrence. About the risk factors, was there has any difference between ACI and POCI, the conclusions was inconsistent. As the important risk factors of AIS, diabetes mellitus (DM) had obvious impact on both of subtypes, but DM was more prone to linked with POCI , which was identified in many studies include ours (Article in Chinese) [2–4]. A study from China demonstrated, not only diabetes mellitus, but also male gender was associated with greater likelihood of POCI than ACI . Diabetes mellitus had obvious impact on the lipids, which mainly reflects in the rise of Triglyceride (TG) and fall of High density lipoprotein cholesterol (HDL-C) [6, 7]. Both the blood glucose and lipids would play the important role on the occurrence of arteriosclerosis, while lipids would play the more direct role [8, 9]. Did this mean that the induction of arteriosclerosis and ischemic stroke by DM was through lipids, and this was proved in our previous study, that was, low level of HDL-C was correlated to the occurrence of AIS induced by DM , which demonstrated that dyslipidaemia was prone to happening in the AIS with DM. 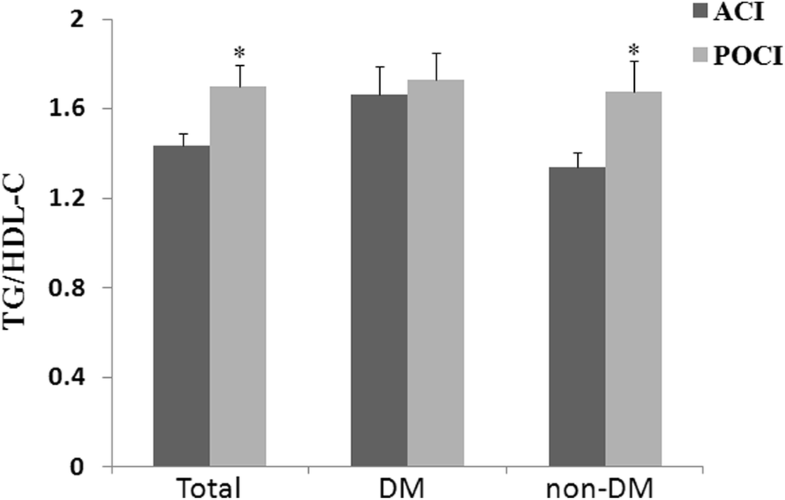 There was more percentage of DM in the POCI, also, DM would have the impact on the expression of lipids. Based on the background above, we wonder if there would have more dyslipidaemia in the POCI compared to the ACI, which maybe act as the important pathogenic factors of POCI. Data for this retrospective study was collected from the hospitalization patients of department of neurology in Affiliated Drum Tower Hospital of Nanjing University Medical School from October 2008 to May 2012, AIS was defined as symptom onset within7 days. The study was approved by our institutional committee. Patients who were found with pre-stroke impairment or insulin-dependent diabetes mellitus were excluded. At admission, plain CT scan of the head was done to rule out haemorrhage and MRI was done to identify the new infarction and the location of the lesion, otherwise such patients would also be excluded. The stroke subtype (ACI and POCI) was defined based on the classification of Bogousslavsky’s . Hypertension and DM were defined as participants with history of relative disease or new diagnosis according to the China hypertension and DM standard (just non-insulin-dependent diabetes were included), while atrial fibrillation (AF) was defined as participants with history of AF or new diagnosis by electrocardiogram. Venous blood was collected following overnight fasting for at least 12 h, and analyzed by a solid-phase chemiluminescent immunometric assay on Immulite 2000 with the manufacturer’s reagents as directed to detect total bilirubin (Tbil), direct bilirubin (Dbil), blood glucose (BG), uric acid (UA), TG, total cholesterol (TC), HDL-C, Low density lipoprotein cholesterol (LDL-C). Statistical analyses were performed with SPSS 17.0 software. The results are expressed as constituent ratio for categorical variables (χ2 test) and as mean ± SEM for the continuous variables (t-test) depending on their normal distribution. The level-risk relationship was expressed as an OR, with a corresponding 95% CI, through logistic regression. Level of significance for statistical purposes was stated at p < 0.05. Six hundred ten patients with AIS were included in the trial, among them, 385 were male and 225 were female, whose age range from 15 to 92. There were 202 patients who had DM coexisted with AIS. Infarction happened to the ACI was 428, and POCI was 182. There was 29% of DM in the ACI, while 42.9% in the POCI, the difference was significant (P = 0.001), the same trend was existed in hypertension and BG. While AF and Dbil were more prevalent in ACI. Also, the difference of TG and HDL-C between ACI and POCI was significant, as shown in Table 1. DM would have the impact on express of lipids , which had been proved in a series of studies include ours . Due to more DM coexisted with POCI, we wonder if this kind of distribution difference resulted in difference of the lipids between ACI and POCI. But to our surprised, elevated TG and decreased HDL-C were just seen in the populations of AIS without DM, while not in the AIS with DM (Table 2). HDL cholesterol concentrations were grouped into 3 levels: < 1.03, 1.03–1.53 and > 1.53 mmol/l. 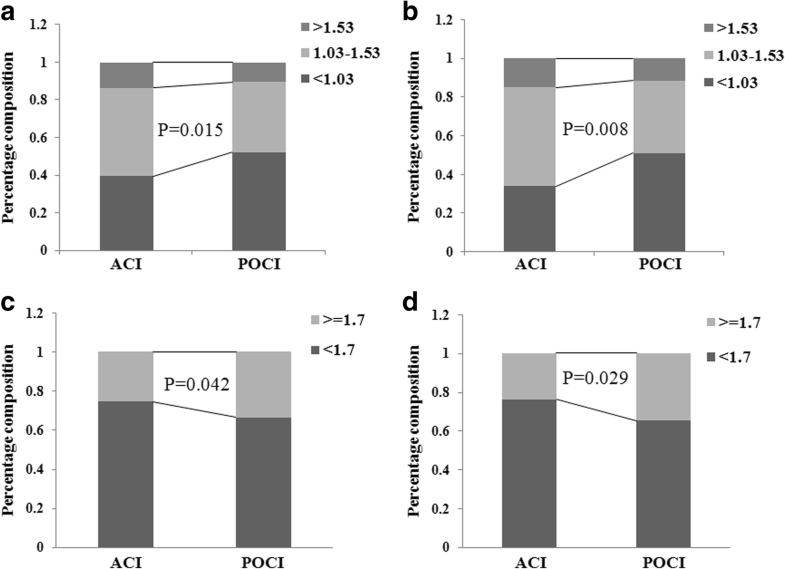 We analyzed the difference of distribution of HDL-C between the POCI and ACI whenever in the total or AIS without DM populations, and found that, the percent of low HDL-C level was higher in POCI group than that in ACI group. Also, TG concentrations were grouped into 2 levels: < 1.7 and > 1.7 mmol/l, we found, the percent of high TG level was higher in POCI group than that in ACI group both in the total or AIS without DM populations (Fig. 1). Dyslipidaemia in the POCI was mainly resulted from the change of TG and HDL-C, while the ratio of TG/HDL-C could be used as the marker in prognosis of vascular events , so we compared the ratio of TG/HDL-C between ACI and POCI. We found that TG/HDL-C ratios was higher in the POCI compared to the ACI both in the total and non-diabetic populations, which demonstrated that dyslipidaemia played the more important role on POCI (Fig. 2). All the patients of AIS, were divided into two groups named ACI and POCI based on the location of infarction. To study the risk factors of POCI, we first performed the single-factor logistic regression, and found that TG, HDL-C and TG/HDL-C ratio were correlated to the POCI, but after multivariable logistic regression analysis, the correlation was disappeared (Table 3). Populations of AIS without DM were also divided into ACI and POCI, logistic regression demonstrated that TG, HDL-C and TG/HDL-C ratio were correlated to the POCI, whatever in the single-factor or multivariable logistic regression (Table 4). Our investigation was a retrospective study of patients with AIS in which the correlation between POCI and lipids was evaluated. We first confirmed that there was more percentage of DM in the POCI compared to the ACI, while DM would have the impact on the expression of lipids, which has been identified in our previous study . We hypothesize that this kind of distribution difference would result in difference of lipids between ACI and POCI, but this hypothesis was uncorrected. In fact, the significant difference of TG, HDL, TG/HDL-C between ACI and POCI were just existed in the populations of non-diabetic AIS, which was correlated to the pathogenesis of POCI. The association between DM and POCI has been proved in previous studies [15, 16]. In a prospective study in Koreans, DM was an independent risk factor for intracranial atherosclerosis only in posterior circulation . These researchers speculated that the effect of metabolic disorders was more related to the POCI, which indicated the differing neurovascular origins of POCI and ACI . In our research, we found that more DM coexisted with POCI compared to the ACI, which seemed to demonstrate that DM cause dyslipidaemia and finally increase the incidence of POCI. Dyslipidaemia was prone to happening in the diabetic populations [17, 18], which played important role in the pathogenesis of AIS. Insulin resistance (IR) existed in many diabetic population and altered the lipids and lipoprotein metabolism [6, 19, 20]. Through a series of signaling pathways adjusting, the decrease in HDL available for participation in reverse cholesterol transport may finally caused the atherogenicity in AIS . In the prevention of AIS linked to the DM, management of lipids was important as well as the glucose control . Compared to the diabetic populations, what we should do in the non-diabetic populations? There did not involve the glucose control, but dyslipidaemia also act as an important risk factors, mainly in the POCI, which was identified in this study. Low levels of HDL-C had been proved correlated with AIS [23–25], but the difference between POCI and ACI was unclear. In our study, elevated TG/HDL-C ratio was prone to happening in the POCI compared to the ACI, both in the total and non-diabetic populations, while not in the populations of DM. Why was this kind of manifest? We found, level of TG was higher and HDL-C was lower in the POCI of total and non-diabetic patients, resulting in higher TG/HDL-C ratios compared to the ACI, while the level of TG and HDL-C had no difference between POCI and ACI in the diabetic patients. Perhaps this kind of infarction location difference also shown difference of the expression of HDL-C and TG, but compared to the influence of DM, the former is negligible, and finally determined that there had no difference of HDL-C and TG between ACI and POCI in the diabetic patients. In order to confirm whether our hypothesis was right, we studied the risk factors of POCI in total and patients without DM. We observed the elevated TG/HDL-C ratio in the POCI rooted from the rise of TG and fall of HDL-C, then, logistic regression demonstrated it was correlated to the POCI just in the non-diabetic populations, which indicated that elevated TG/ HDL-C ratio was an important risk factor in the pathogenesis of POCI in the non-diabetic populations. Elevated TG and decreased HDL-C were thought to be asatherogenic dyslipidaemia  and the key metabolic abnormalities in insulin resistance (IR) states , which was familiar in the patients of DM. This result we found perhaps predicate that more patients of POCI had been in the condition of pre-diabetes. Our current study provided the evidence that high level of TG and low level of HDL-C, furthermore, elevated TG/HDL-C ratio, were correlated to the occurrence of POCI in the non-diabetic populations. We would certainly give enough attentions to the dyslipidaemia in the diabetic patients , but to prevent the occurrence of ischemic stroke in the non-diabetic populations, more attentions should be paid to the change of the lipids including TG, HDL-C and TG/HDL-C ratio, which has the obvious correlation with POCI. Yun Luo and Zheng Li contributed equally to this work. I would like to express my gratitude to all those who have helped me during the course of study and writing of this paper. I gratefully acknowledge the help of my colleagues who provided us enough research objects. This work was supported by National Natural Science Foundation of China (81671140) and Nanjing Medical Science and technique Development Foundation (QRX17002). YL, ZL and JWL designed the study and participated in acquisition of data; YL, JHZ, ZJL undertook the statistical analysis and wrote the manuscript. ZL revised the manuscript critically for important intellectual content and languages. All authors read and approved the final manuscript. This study was approved by the ethics committee of Affiliated Drum Tower Hospital of Nanjing University Medical School and conducted in accordance with the ethical principles of by the Declaration of Helsinki. Written informed consent was obtained from all patients.